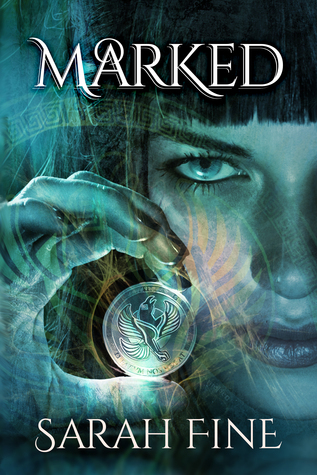 Marked by Sarah Fine is the first book in her Servants of Fate series and is a wonderful introduction to her dystopian world set approximately 100 years into the future that is now more or less lawless and run down due to an environmental collapse. Our MC Cacia Ferry is a dedicated, respected and sweet character she is also what is known as a Ferry – she moves the marked dead onto the Afterlife. It’s a role she is dedicated to and keeps secret; it also helps in her job as a paramedic. New to Boston and Cacia’s new partner is Eli Margolis, Eli was a character I instantly adored – he melted my heart with his dedication to his sister; but Eli also has a bit of an interesting back-story that I was eager to learn more about and I was quietly shocked when it was revealed. His past was heart-breaking but the type of person he was is one that I loved reading about, loyal, kind, smexy and devoted. The attraction between Cacia and Eli is intense, I do call it insta-love/insta-lust but it worked and it was believable; their interactions had me swooning and the smexy moments were quite steamy. The secondary characters were all fleshed out perfectly and each play a pivotal role in the overall story, I was especially curious about Galena, Eli’s sister. I was not only curious about the Ferry’s and the hierarchy but also the Ker, immortal agents who mark people for death. The plot was fast paced and engaging, I was keen to learn who the rogue Ker was marking people for death and was shocked at who it actually was and their motives, definitely not expected; I liked the element of surprise. What reduced my rating for the book was the world-building, Pittsburgh was a wasteland and Boston was flooded; mention was made of how hard things were to come by such as flowing clean water but we don’t really find out what eventuated besides an environmental collapse to cause society to be the way it was. I was also curious about the pirate subplot and who/what they were but it wasn’t expanded upon unfortunately. I needed more details. Marked introduces us to a deeply inventive world that pulls you in as we are introduced to the mythological Charon and Fates, it was creative and beautifully written, we get both Cacy and Eli’s POV’s which assisted the storyline, it moved along at a realistic pace and gave us many twists and turns I didn’t expect. The fast-pace and witty dialogue made this a book that was difficult to put down. Marked was a great start to Sarah Fine’s dystopian/Paranormal romance series; I am more than eager to read the next book in the series, Claimed. Thank you Benish :-) the cover is gorgeous; I hope you get a chance to read this book.